Our friend DorfDiscoBraunsFeld has closed his blog a while ago. 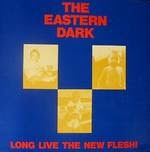 This means the brilliant first EP from the Eastern Dark is now offline. This is a must-hear for all Aussie Rroch fans. Off AMO "… The group achieved early notoriety for their habit of opening their sets with a Ramones song; in fact playing each Ramones song once only in chronological/album listing order. A growing audience followed them as much for heir on stage goofiness and strong harmonies as their no nonsense rock. By early '85 the group was ready to record a single. Released in July and produced by Rob Younger, 'Julie Is A Junkie/Johnny And Dee Dee' was hailed as a power pop classic in underground press the world over. An inspired homage to the Ramones, it even got the group some mail from da Brudders. With Rob Younger again at the helm, the band put to tape the EP Long Live The New Flesh, with which their scope was widened without losing any power or immediacy. With a cassette of the freshly mixed record with them, the band routinely set off for the 900 km drive to Melbourne for some shows when tragedy struck. The EP was released soon after to a mixture of wonder at its contents and renewed grief for such potential cut short…"